Crisp rice has always been a favorite staple of mine in the various niches of candy out there. Krackle, Crunch, and of course, 100 Grand all come to mind. Itâ€™s never been a candy I think has been fully pushed to its amazing potential, and since the retirement of the Caravelle Bar, I donâ€™t think the world has had any close competitors to assume that challenge. Regardless, I still like Krackle and 100 Grand bars a great deal (and to a lesser extent Crunch). I just always wished there could be something more to them. I would be willing to try anything that could give crisp rice bars the success they deserve. And in this case, anything meant purchasing the Limited Edition 100 Grand Dark Bar from a candy bin at the Dollar Tree Store, a product that had ceased to be marketed about two years ago. Like so many candies I didnâ€™t get to try, this one debuted while I lived outside of the U.S., and had made a quick exit before I had the chance to return. But the fact that it had long since expired did little to dissuade me from ripping open the wrapper. I have always had a sweet tooth, hell I’ve always had a sweet mouth. And as a child, whatever I found at the store delighted me. “Oh I found a big Hershey bar – magic has surely been done here!” But I am no longer a child and I am fairly certain the tooth fairy is a tooth junkie, and I am not amused, candy companies… not amused…. You litter the field with genre after genre of limited edition candies, some I hate and some I love, and then you yank them away leaving me the crumbs of the same tired fooking thing time after time. Like expecting a full fridge and finding only milk, eggs, and bread… sure you can do lots with them but ENOUGH IS ENOUGH. 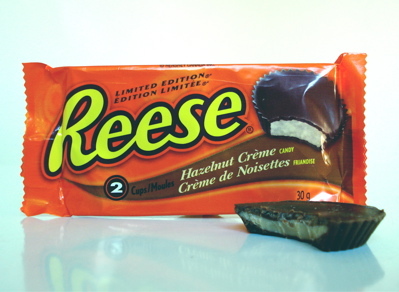 Getting rid of Twix Java and leaving us with another PB disaster is the last straw. Stop giving us remixed, boring candy and take a page from the other countries who do something amazing, and spread themselves out, like the branches of a well-grown tree. Enough crap. Bring back the good, the bad and the different! We pay your salary, you miserable two-bit toothless old tooth fairies… we may like our butter and creme and fattening convenient things… but that doesn’t mean we’re paying you to kill us with monotony! We’re paying you to make it pleasant to live with dunderheads like YOU! What do you think? Agree? Disagree? 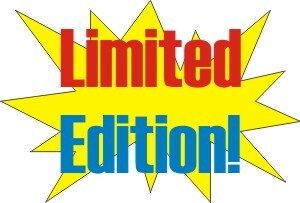 What’s your favorite current or past Limited Edition candy? They’re finally here! 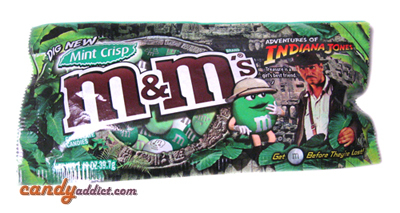 The long awaited Mint Crisp M&Ms that we heard were coming out in time for the new Indiana Jones movie are finally on shelves. And not a moment too soon! Between my eagerness to see Indy in his new geriatric adventure glory and tasting the new M&Ms adventure that Mars has planned for us, I could hardly contain my excitement when I found these in the store. It was like finding Indy’s candy holy grail in a way. The M&Ms are not the only new candy with the Indiana Jones tie-in. There’s also the Snickers Adventure Bar that I reviewed back in January. The plain Milk Chocolate, Peanut and the new Mint Crisp M&Ms are outfitted in new themed packages and they are quite attractive I admit (more so than the Shrek and the Pirates of the Caribbean ones M&Ms). Of course the Mint Crisp ones are a special limited edition flavor tied to the movie like the White Chocolate Pirate Pearls were.